The James Koetting Ghana Field Recordings collection presents a vibrant mix of traditional and popular music recorded at a broad range of locations and events in Ghana during the 1970s by ethnomusicologist James Koetting. Students and researchers can hear online the complete archive of Koetting's field tapes — 142 audio reel tapes — of musical performances from arts festivals, traditional ceremonies and events, stage concerts, church services, and less formal gatherings and sessions throughout Ghana. 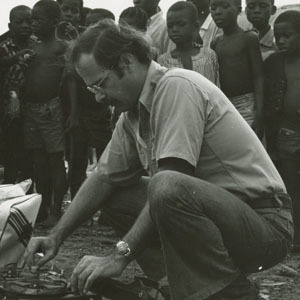 As one of the largest collections of field recordings from Ghana, this digital collection includes recorded interviews, musical demonstrations, field notebooks, photographs, commentary, and other original source material surrounding Koetting's research. The collection highlights his extensive work with Kasena musicians in Accra (Nima) and in the Kasena region near the country's border with Burkina Faso and also documents Akan, Ewe, Ga, Dagomba, and other musical types and activities of the time. Koetting served on the Brown University Music faculty from 1975 until his death in 1984. This project is supported, in part, by the Scott Chanchien Memorial Library Fund.